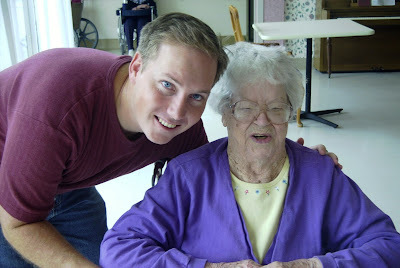 My great-grandmother Nellie Burr died yesterday at the age of 102. 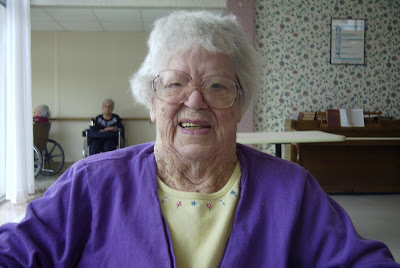 For someone who has spent the last 8 years in a nursing home, Independence Day was an appropriate time to be freed from this earthly body and reunited with her Savior and loved ones. Many of them had been waiting a long time for her. A lot has happened in her lifetime and my dad interviewed her on video not long ago about her life. I wish today that I could sit down and watch that video. These are some of the things that she predated by being born in 1905. Theodore Roosevelt was president, so she has seen 17 US Presidents. Wilbur and Orville get the Wright Flyer III to stay airborne for 39 minutes, the longest flight to date and the first over 30 minutes. Novocaine was introduced by Albert Einhorn and aren't we all thankful for that. I could go on but I think most would agree that she lived during some of the most exciting times in all of history and now she is living eternally ever after!